Last night, the Bobcats burned the Sun Devils in the 2019 NCAA Midwest Regional semifinal, moving them one step closer to the Frozen Four. Tonight, they can punch their ticket to Buffalo, but must go through the reigning national champions to do so. The No. 2 seeded Quinnipiac Bobcats (26-9-2, 14-6-2 ECAC Hockey) take on the No. 1 seeded Minnesota-Duluth Bulldogs (26-11-2, 14-9-1 National Collegiate Hockey Conference) in the final of the 2019 NCAA Tournament Midwest Regional, with a spot in Buffalo, and the Frozen Four, on the line. 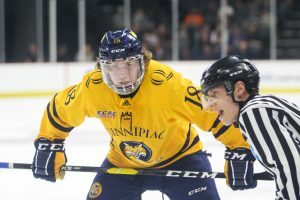 Quinnipiac defeated Arizona State in the semifinals by a score of 2-1 on Saturday night to advance in the tournament. Joe O’Connor opened the scoring in the first period, and William Fallstrom scored what would turn out to be the game-winning goal in the second period. ASU’s Brinson Pasichnuk scored in the third period to cut the Bobcats lead to one, but junior goaltender Andrew Shortridge stood tall, stopping 20 of 21 shots to earn his 18th victory of the season. Arizona State goaltender Joey Daccord put up quite the effort of his own, stopping 36 of 38 Bobcat shots, but Quinnipiac would go on to win by a goal. Minnesota-Duluth defeated No. 4 seeded Bowling Green on Saturday night by a score of 2-1 in overtime. Bowling Green’s Brandon Kruse broke the tie in the second period, but UMD’s Parker Mackay evened the score in the third period to send the game to overtime. Mackay would score his second of the game 11:45 into overtime, winning the game for the Bulldogs, who advance to the regional final. Duluth goaltender Hunter Shepard stopped 30 of 31 shots against him to earn his 26th win of the season. Quinnipiac’s appearance in the regional final is their first since the 2015-16 season, when they defeated UMass Lowell by a score of 4-1 to advance to the Frozen Four. Consistently one of the best teams in the nation, Minnesota-Duluth is appearing in their fifth straight regional final game. Last season, they defeated Air Force 2-1 in the West Regional final en route to their second national title in program history. * Joe O’Connor scored his third goal of the season last night. He also had two assists in the final weekend of the regular season. * William Fallstrom scored the game-winning goal for the Bobcats in the second period against Arizona State. He also had an assist in Game 2 of the ECAC quarterfinals against Brown. * Alex Whelan recorded an assist last night, running his point total over the past two games to 4 points. * Andrew Shortridge won his 18th game of the season against Arizona State. He continues to lead the nation in goals against average (1.49) and save percentage (.941) for goaltenders with at least 20 games played. * The Bulldogs have been no stranger to the national spotlight, as Noah Cates, Dylan Samberg, Scott Perunovich, Riley Tufte and Mikey Anderson have all played or the United States World Junior Championship team. * Senior forward Parker Mackay leads the Bulldogs in scoring with 29 points on the season. The senior scored both goals against Bowling Green on Saturday night. * Perunovich, a sophomore defenseman, is right on Mackay’s heels, with 28 points this season. Perunovich’s 25 assists are tied for 10th in the nation among defensemen. * Junior goaltender Hunter Shepard has been strong all season long, starting all of his team’s 39 games. He comes into today’s game having played all but 16:09 this season. Join Steven Pappas and Dan Bahl for the call on QBSN. Puck drop is scheduled for 6:30, and the broadcast gets underway at 6:15 with the QBSN Pregame Show. You can listen at www.mixlr.com/qbsn, and you can follow our social media accounts @QBSN on both Twitter and Instagram.